Join James and a crew of magical, overgrown insects as they journey aboard a giant peach across the Atlantic Ocean, encountering everything from singing cloud men to peach-eating sharks. 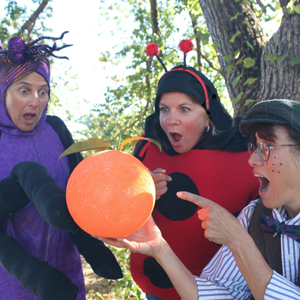 Kathy Bradley and David Shepard’s musical adaptation of Roald Dahl’s classic story features a cast colorful characters, including James, all his friends and his two mean Aunts who end up in a very sticky situation! Thusday, March 6, 9:30 and 11 a.m.
To reserve seats for groups of 10 or more, print and mail or FAX our reservation form. All seats are $8, with scholarship seats for $4 available with program administrator signature verifying the number of Federal reduced price lunch students (or need-based scholarship students at private schools. Reservations are confirmed via email after payment in full is received. Telephone and FAX orders ARE accepted with credit card payment. Call 415-457-4878 or FAX to 415-457-4879.